Welcome to Knighted: An Interdisciplinary Journal of Undergraduate Research! 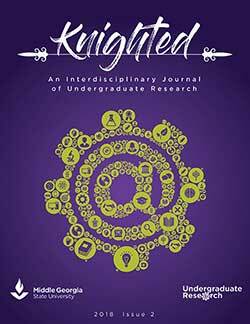 Welcome to Knighted: An Interdisciplinary Journal of Undergraduate Research! This inaugural edition brings together student scholarship from a variety of disciplines, including English, history, biology, film, and fashion. Knighted showcases the breadth and depth of undergraduate research at Middle Georgia State University. The Council for Undergraduate Research says that student research should make “an original intellectual or creative contribution to the discipline,” and we think that the promising scholarship assembled in the pages that follow does just that. From “Upcycling” in the world of fashion, to the memory of a little-known and poorly understood conflict between Dakotas and white settlers, to sharp analysis of roles for women of color in media, to turtle trapping techniques, we were fascinated and impressed by the students', and we hope you will be too! 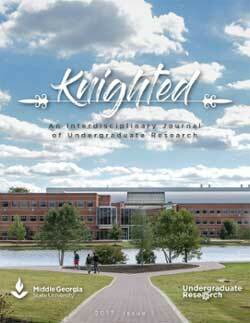 Knighted: An Interdisciplinary Journal of Undergraduate Research seeks to highlight the diverse array of fine undergraduate work being done across a wide variety of disciplines at Middle Georgia State University. The University's mission statement calls attention to “lifelong learners whose scholarship and careers enhance the region,” and we believe that Knighted does precisely that by providing a public venue for students to demonstrate their research skills. In addition, the University's Quality Enhancement Plan, Experiential Learning@MGA, fosters an academic environment and provides students opportunities to engage in exploration and application beyond the classroom, with emphasis on the completion of research projects with support from the institution and mentorship of faculty. By going through the process of submission and peer review, students get an in-depth feel for the craft of scholarly research. The 2018 call for papers is active. Students may submit original work that was completed as an undergraduate at Middle Georgia State University. Original research projects, including those developed in collaboration with faculty mentors, are welcome from all departments and disciplines. Faculty in the appropriate discipline will review all submissions. The best papers from the Undergraduate Conference are automatically accepted, and submissions to the conference are eligible for faculty review for possible inclusion. Typed manuscripts should be submitted as MSWord files to ExperientialLearning@MGA.edu. They should be double-spaced, with one-inch margins, and in 12 point Times New Roman font. Illustrations, tables, and figure legends should be embedded within the text at the locations preferred by the authors. Citations should be formatted in the most recent editions of the citation style appropriate to their academic disciplines, e.g. MLA, Chicago, APA, etc. The chosen format must be used consistently throughout the manuscript. Each submission to the journal requires a faculty endorsement. Have the sponsoring faculty member email the Office of Experiential Learning at ExperientialLearning@MGA.edu. The deadline for submissions will be Friday April 20th.